Mainly composed of the Pre-Raphaelite water-colours which are part of the Ashmolean Museum collection, this is the first exhibition devoted to the Pre-Raphaelites that Italy has ever hosted, and its location in Ravenna is not accidental. 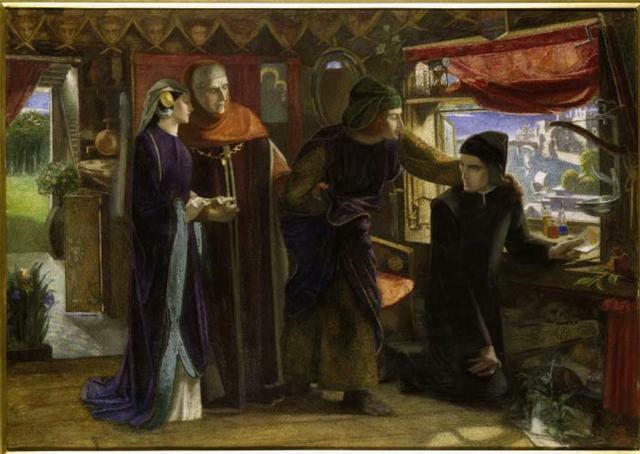 In 2004 the MAR (Museum of Art of Ravenna) organized a fine event dedicated to nineteenth-century British water-colour drawing which focused on the autonomy of this artistic technique, famously defined as “the truly English art” by the Palgrave brothers in A Century of Painters of the English School (1862). The statement of intent of the 2004 exhibition was a revaluation of nineteenth-century British Art, whose erratic critical fortune in the twentieth century had less to do with its intrinsic artistic quality than with the indisputable supremacy enjoyed by French painting. By all accounts, it still looks like – after exactly one hundred years from the first Post-Impressionist exhibition in Britain – one cannot enjoy both French and British art without meeting with osmotic disapproval. However, now that the ghost of Modernism looms small off our horizon – despite some Mr Bennetts of our times who still think in twentieth-century terms – Victorian painting is slowly reacquiring its place in the sun, if not its aura. And technological reproduction is an important point here, since many of the works displayed in Ravenna show the Pre-Raphaelites’ concern for accurate observation, maintenance and preservation of those Italian works of art which risk(ed) to be damaged by irresponsible restorations and neglect. 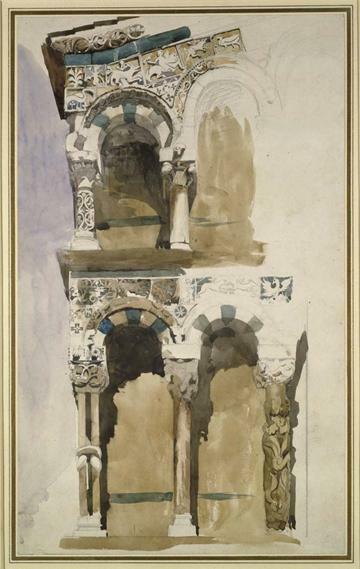 For instance, John Ruskin’s splendid and rare water-colours – and those of his pupils like George Price Boyce, Arthur Burgess and Henry Roderick Newman – show all his idiosyncratic critical energy, firstly because they manage to convey his early idea that drawings should be exact documents of the objects represented, made on behalf of those who cannot visit those sites for real; and secondly because unlike daguerreotypes, the inclusive realism of these drawings is able to communicate the pulsating energy of those places, which were perceived as sacred not only because the objects depicted are often places of worship, but because the spiritual crisis gone through the nineteenth century – which Ruskin felt deeply and dramatically during his mature years – led Victorian artists to conceive art as sacred. 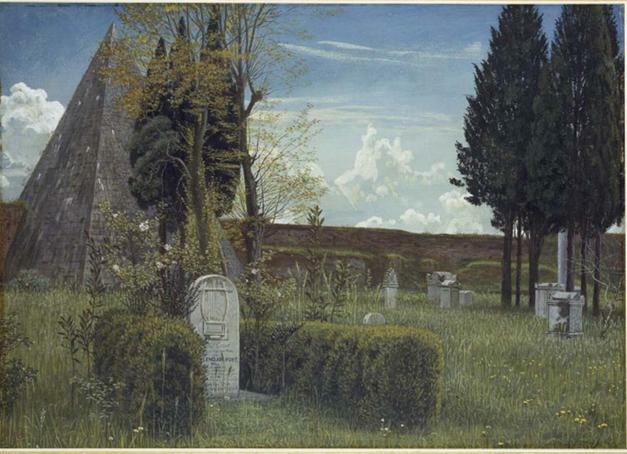 It is especially by virtue of these reasons that Ruskin’s artistic sensitivity has been defined as “ecological”,[i] and it is also in the Pre-Raphaelites’ ecological concern that one can find their modernity. The leitmotiv of this exhibition is Italy, indeed, and the show opens with a gallery devoted to the “real” Pre-Raphaelites, i.e. those Italian primitives whose works influenced the mid-Victorian brotherhood (among them Lorenzo Costa, Perugino and Beato Angelico). Italy as visualized in a “dream” – as the title goes – especially for those Pre-Raphaelite brothers like Dante Gabriel Rossetti who never visited it. The water-colours shown here are among his prettiest and they all deal with Dante: the superlative Dante Drawing an Angel on the First Anniversary of the Death of Beatrice (1853) is flanked by Dante’s Vision of Rachel and Leah (1855) and the Paolo and Francesca pictures (the fact that Dante’s tomb is in Ravenna makes the location of this exhibition even more appropriate). Italy is here conceived as a primary source, often filtered through the medium of art, though: it is certainly the case of Carlo Lasinio’s etchings of the Camposanto in Pisa, which proved highly influential to Ruskin, Hunt, Millais, and Rossetti. Apparently, it was the study of Lasinio’s etchings of Benozzo Gozzoli’s frescoes that convinced the Pre-Raphaelites to reject late-Renaissance art in favour of the primitives. In those times when the early Italian masters were only conceived as propaedeutic to the formal perfection later obtained by Renaissance artists like Michelangelo and Raphael, the Pre-Raphaelites broke the orderly chronological conception of art of their times and reevaluated the primitives by virtue of their religious authenticity (aided in this by Alexis François Rio’s De la poésie chrétienne, first published in 1836). Heirs to the Romantic poets they so loved, the Pre-Raphaelites may have mistaken the effects for the intentions, but they certainly managed to give feeling and imagination a preeminent part within the artistic debate. The only artist among them who copied the Camposanto frescoes on the spot was Edward Burne-Jones, who firstly visited Italy in 1859 together with Ruskin. The exhibition shows Burne-Jones’s preparatory cartoons of the mosaic of the apse of Saint Paul’s within the Walls, the first non-Catholic church built in Rome after 1870 (the year when Rome was annexed to Italy). Also interesting are the Italian landscape paintings made by artists like William Bell Scott, Walter Crane and George Howard, whose water-colours of the Non-Catholic Cemetery in Rome form a pretty collection; and those by the so-called “Etruscan” painters, the English artists who travelled extensively to Italy and came in close contact with the Italian painter Giovanni Costa. This part of the exhibition includes fine oils by Frederick Leighton, whose work can also be found in another section of the exhibition devoted to the influence of Renaissance on those British artists of the middle and late Victorian period who are sometimes defined as Pre-Raphaelites of the second and third generation but are actually more akin to Aestheticism. Among them, Frederick Sandys, Edward Burne-Jones and Rossetti himself, whose later pictures famously abandoned the primitive style of his early career to embrace rich Venetian atmospheres. Perhaps the most beautiful of the paintings exhibited in this section is Marie Spartali Stillman’s The Enchanted Garden of Messer Ansaldo (1889). As an Italian Victorianist – and associate editor of a journal entitled Ravenna – I am particularly enthusiastic about this exhibition. I am also struck by the fact that, in these days of ours when museums often need to rely on smash hits to advertise their shows, the MAR and the Ashmolean Museum have managed to create a successful event – both in terms of audience response and cultural capital employed – by means of water-colours and apparently minor works which seem to be more suitable to the pleasure of the academic scholar than that of the general public. I won’t go so far as to write that this is promising, but certainly it is very good news indeed. Luca Caddia received his Doctorate in English Literature in 2008 from the University of Rome “La Sapienza”. His doctoral dissertation dealt with the relationship between character and career in Anthony Trollope’s Palliser Novels. In the Academic Year 2009-10 he has obtained a residential fellowship at the Yale Center for British Art and a Paul Mellon Grant for his research project on collecting in Sir Lawrence Alma-Tadema’s paintings. [i] Desire and Excess: the Nineteenth-Century Culture of Art, by Jonah Siegel, Princeton University Press, Princeton and Oxford, 2000, p. 189.